Welcome! Greenwood Montessori School is a private preschool and kindergarten in Warwick, Rhode Island. Here, your child will be immersed in a peaceful, innovative and educational environment that will challenge, intrigue and delight. At Greenwood Montessori School, all children are viewed as individuals and are exposed to meaningful learning experiences where they are allowed, with guidance from the teacher, to educate themselves at their own developmental level. Children in control of their own learning build confidence in themselves and are then willing and able to embrace life's opportunities and challenges and become successful in future endeavors. Greenwood Montessori School is located on beautiful, secluded grounds nestled in the woods surrounding Little Gorton's Pond in Warwick, Rhode Island. Our outdoor setting enjoys frequent "visits" from such creatures as deer, turtles, geese, turkeys and our "resident" blue heron - to name just a few! The indoor environment is equally inviting, designed and prepared with great care and enthusiasm by trained teachers, and offering a purposeful, safe, aesthetically-pleasing and enriched learning and social setting for young children. The story began with a Mom who simply wanted to be with her child. While working as a secretary, away from her young daughter who was in a home day care, Miss Brenda was approached with an offer to run a Montessori school. Though having never heard of Maria Montessori or her method, she embraced the opportunity without hesitation, as she would have her daughter with her at the School. Twenty-plus years later, another child, Montessori training, a grandchild, the opening of a second school, and all-things Montessori now sealed in her soul, Miss Brenda could not be more grateful for that initial opportunity. To work in a field about which she is passionate, and to provide her children, grandchild and all the many more children who have come our way with such a wonderful early learning experience, is beyond rewarding. As they say, "It's a beautiful thing when a passion and a career come together." Greenwood Montessori School is committed to nurturing the whole child, giving equal value to their social, emotional, academic and spiritual development, as they grow in age, wisdom and grace. It is a mission of the heart, equipping young children to become the best version of themselves, in all of these dimensions. 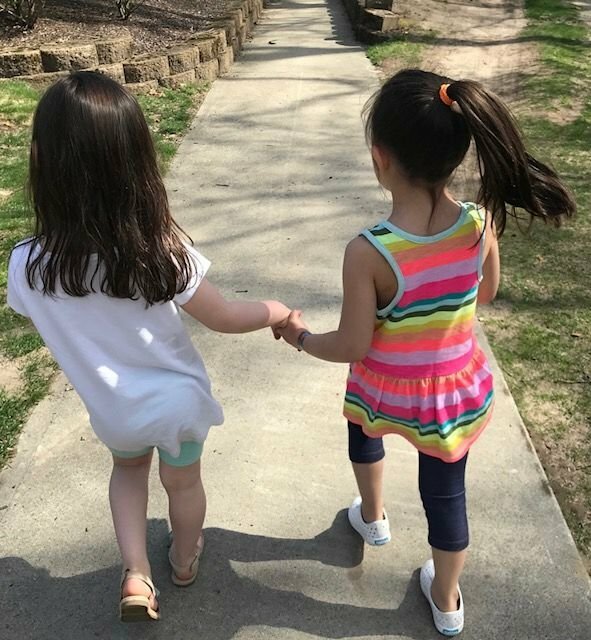 We encourage an atmosphere of trust, kindness and respect and endeavor to nurture each child’s independence, love of learning and positive sense of self and others. 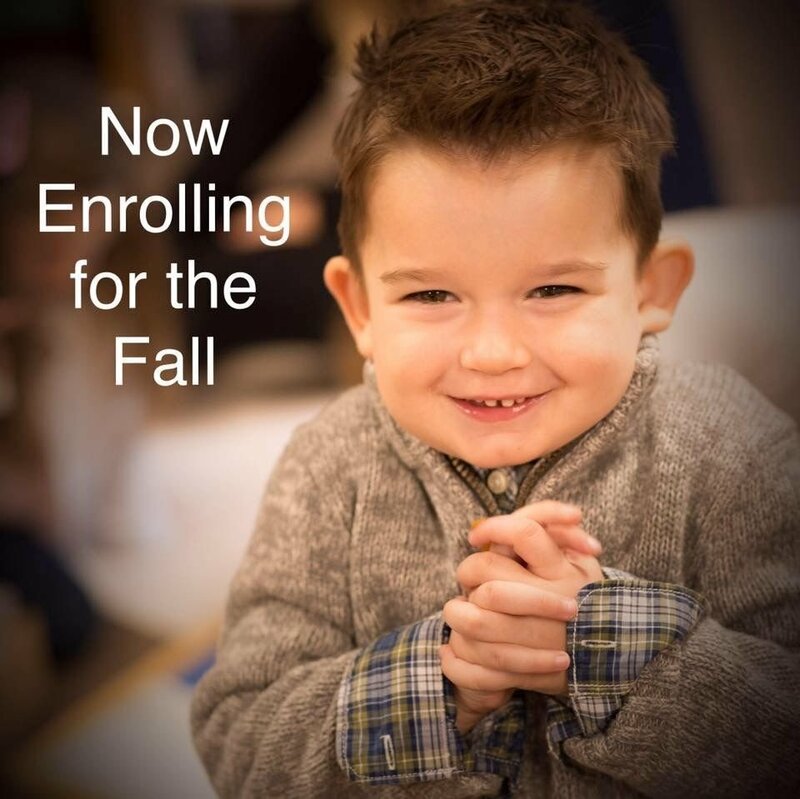 Greenwood Montessori School is a non-denominational Christian community that aims to foster competent, responsible, adaptive citizens who are life-long learners and problem-solvers. In addition, we seek to help children gain an understanding of God, according to their curiosity and needs, and to see their important role both in the classroom and in the world. We do so through the use of books, activities and classroom conversation, with the understanding and acknowledgment of, and respect for, the diverse beliefs of the class as a whole. We welcome children of all racial, cultural, religious and economic backgrounds and do not discriminate on the basis of such in our admissions process. We believe in the importance of parental involvement in support of children’s development and learning and are, therefore, open to suggestions, new ideas and continual growth. Greenwood Montessori School was established on the belief that children between birth and 6 years of age develop physically, intellectually, emotionally and socially at a rate that will never again be duplicated in their lifetime. Once these precious years have passed, so has an enormous potential for learning. Our educational philosophy is based on the work of Dr. Maria Montessori (1870-1952), an Italian physician and educator, who saw the early years of life as crucial to the future growth and development of the individual. In her writings, Dr. Montessori frequently compared the young mind to a sponge, literally absorbing information from their environment. A central tenant of our philosophy is that "all children belong." We believe that diversity is to be valued and that every child is entitled to respect, dignity, equal rights under the law and opportunities for fulfillment within our School and the community. Through teamwork, parent/teacher collaboration, co-planning, relevant professional development and the use of community resources, we are committed to providing an inclusive environment for children with special needs and/or disabilities. Enjoy your journey here, where you will learn more about this unique educational experience. Of course, we invite you to call 401.739.1191 to schedule a visit and further discover what makes our Montessori school so special. The first Casa dei Bambini, or "Children's House", was opened by Dr. Maria Montessori on January 6, 1907 in the low-income district of San Lorenzo, Rome, Italy, as part of an urban revitalization project. Through her observations and work with these children, Dr. Montessori discovered that children had not only a desire to learn but they did so nearly effortlessly. Thus began her life-long pursuit of educational reform. It is amazing to observe children, over a century later, having this same desire and using the tried and true materials of long ago in our modern-day Montessori classroom. Maria Montessori was indeed a woman ahead of her time! 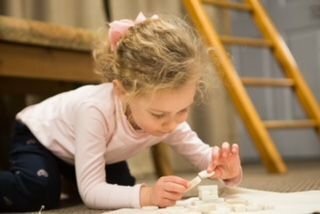 What’s So Different About Montessori? A great deal of the appeal of a Montessori education is visual. When observing a program in action, it is obvious something out of the ordinary is taking place. Groups of children working together cooperatively throughout the morning lend to the calm and peaceful classroom atmosphere. Children learn at their own pace, choosing their work independently, all according to their interests and developmental level. This freedom leads to motivation, concentration, self-discipline and a love of learning. When a Montessori classroom is well tuned, the children begin to make discoveries. These discoveries, along with an atmosphere that encourages individual interests, fuel an emotional relationship with knowledge and encourage a life-long desire to learn. The Montessori class consists of a mixed-aged grouping of children 3 through 5 years of age, enabling the children to help and learn from each other and to develop at their own pace without the pressure of competition. Dr. Montessori learned through her observations that children are happiest in a prepared environment. Greenwood Montessori School’s environment is prepared by a trained teacher and is designed to challenge, intrigue and delight young children while developing their talents. 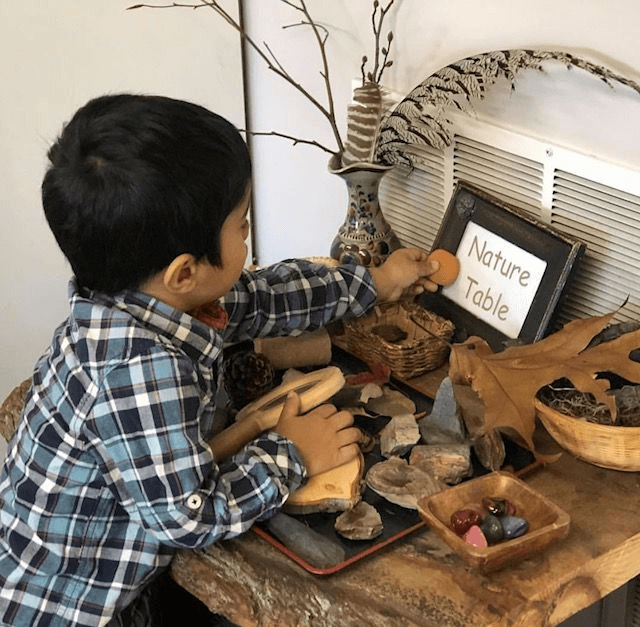 Both the young child’s interest in the environment itself and the older child’s growing awareness of the abstract are nurtured in the Montessori classroom. Click here for a Comparison of Montessori Education with Traditional Education. "Montessori is an education for independence, preparing not just for school but for life." Maria Montessori was an advocate for world peace and said that the spirituality and peace of the children - not the materials - was foremost in her philosophy. It was through her work in education that she came to realize that peace begins in the hearts of the children. Montessori said "...establishing lasting peace is the work of education," and she made it her life's work. As a result of her writing and speaking on the subject of world peace, Maria Montessori was nominated three times for the Nobel Peace Prize. 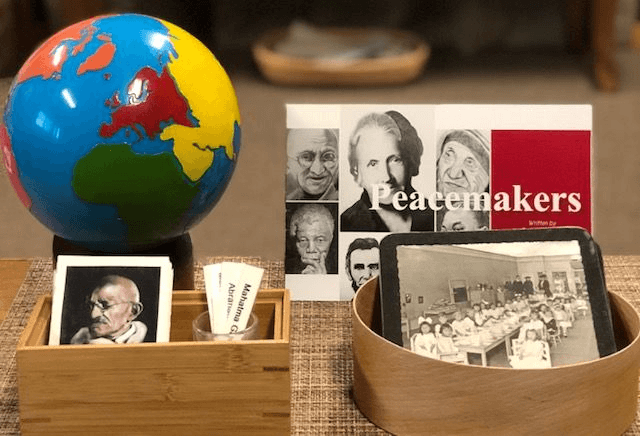 At Greenwood Montessori School, peace education is part of our daily routine. Our Ground Rules, "Be Kind, Be Gentle, Be Safe", are designed to protect the collective good of the community, as well as each individual child. By establishing the ground rules and setting the expected pace early on in the school year, the children gain a sense of security, as they learn that they can expect from others the same as what is expected of them. It's the Golden Rule! Additionally, through various conversations, books and activities, the children discover what it means to be a Peacemaker. They begin to understand that they have the power, and responsibility, to help make their classroom - and the world - a more peaceful, better place. "Peace is what every human being is craving for, and it can be brought about by humanity through the child." The Curriculum. Greenwood Montessori School's curriculum guides children through hands-on activities that develop a life-long love of learning. Independence, concentration, coordination, respect, a sense of order and problem-solving skills form the foundation. Math, reading, science, art, music and movement, communication, social, emotional and physical development excel once this foundation has been laid. The three-strand curriculum of (1) practical life skills (motor and social development), (2) sensory skills (refinement of the five senses) and (3) academic skills (math, read, writing, science, geography, etc.) provide for a unique educational balance and allow each child endless opportunities for self-education. To view our year-long thematic Curriculum Outline, click here. Practical Life. The Practical Life area is the hub of the classroom. The activities within are designed to develop a child’s coordination and independence, build the dexterity of the wrist and enhance the pencil grip...all leading up to writing! Through repeated use of activities such as spooning, pouring, twisting, squeezing and sewing, a child works toward mastery of these skills. Materials also focus on care of the person, care of the environment and grace and courtesy. A sense of order and concentration is promoted through the use of materials in this area. Sensorial. The goal of the Sensorial curriculum is for the child to become an acute observer and to appreciate the beauty and wonder of the world around him. This is done by offering the child beautifully designed materials that isolate concepts of size, color, form, touch, taste, weight, temperature, etc. Each of the human senses is called upon in isolation, thus helping to refine the child’s acuity. The materials begin with simple activities such as matching colors that are the same, building towers of cubes by using the ability to visually discriminate the various sizes of the cubes, and learning the names of geometric figures. The Sensorial curriculum is rich in discovery, manipulation and language enrichment. Language. Dr. Montessori saw the road to reading as a dual path that involved the education of the hand and the education of the mind. Building upon language skills such as listening, understanding and basic speech patterns which s/he has previously acquired, the child moves on to hear and analyze both the sounds and the meaning of language. By using language in the classroom through listening, storytelling, reading and dramatic play, a child develops a love of literature, good communication skills and a strong self-esteem. Materials throughout the classroom offer the child many opportunities to develop the refinement of the hand by calling for careful attention to detail and the use of small muscles. Fine motor coordination is also enhanced through manipulating writing instruments, cutting, drawing, writing and opportunities for creative, artistic expression. Mathematics. In the Montessori Mathematics area, the child is introduced to math concepts and experiences using concrete materials in the environment. Different from traditional mathematics instruction, the abstractions are introduced through sensorial, manipulative experiences that call for the child to order, discriminate, distinguish, make judgments and problem solve. Dr. Montessori designed beautiful, yet simple materials for her Math curriculum. Each material was designed to isolate one concept. The isolated concepts build on one another throughout the curriculum to develop and expand the child’s mathematical understanding and experience. Science & Geography. The Science & Geography Areas of the classroom are rich in culture and information. Subjects such as Air, Land & Water; the Human Body, the Solar System, Dinosaurs and Lifecycles of a Seed, Bird, Frog and Butterfly are just some of the fascinating topics introduced. 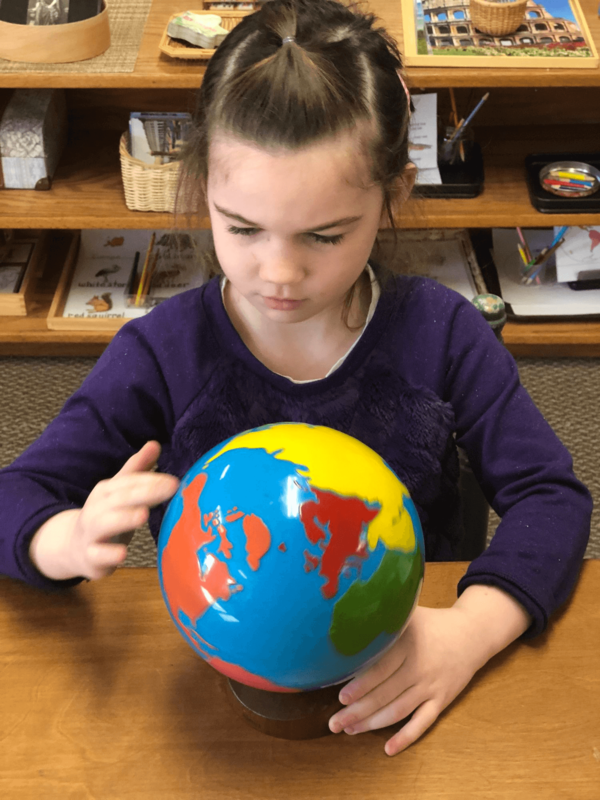 Through the use of the materials in the Geography Area, the children are given a view of the world around them by being introduced to the different continents and their various countries...offering them a glimpse at the customs, cultures and languages of other children all around the world. Art & Music. Art is everywhere in the Montessori classroom. Children can explore with outlines and colors when the Metal Insets in the Language area. Images of famous artwork hang along the classroom walls, and books that highlight the lives and works of famous artists are plentiful. Self-expression and creativity are encouraged in the Montessori Art area, with a focus more on the process than the finished piece. Art activities not only nurture children's creativity but also help to increase their dexterity, concentration, fine motor skills, hand and finger strength and coordination. Filled with appropriate, open-ended materials, the Art area presents children with endless opportunities to use their imaginations and create and learn something new every day! Music is an integral part of our classroom life. It is incorporated daily through song, dance, sound exploration and activities that introduce children to musical instruments and famous composers. The Montessori music curriculum increases children's understanding and enjoyment of music and nurtures their ability to express themselves through music. The Teacher. The real teacher in the Montessori classroom is the child himself/herself. It is the child who leads the way, revealing what s/he most needs to work on. With this in mind, the Montessori teacher operates much differently than the traditional teacher. Rather than setting goals and timed schedules for the children, and using rewards and punishments to influence them to conform, she instead familiarizes herself with the needs of the children through observation. She then becomes aware of the direction in which the child wants to go - seeking ways to help - but never infringing upon the child's freedom to make his/her own discoveries. "The greatest sign of success for a teacher is to be able to say, 'The children are now working as if I did not exist.' "
Schedule: Two-day (T/Th), three-day (M/W/F) and five-day (M-F) options are offered. Alternate schedules and add-on hours may be accommodated based on enrollment and space availability. The following forms and resources are available in pdf format. If you do not have Adobe Reader, click here for a free download.